9 days in Lima (in) to La Paz (out) basis. Tour flows from Machu Picchu (2400m) to Uyuni (3000m), so you’ll have time to fit yourself for the altitude – less problem of altitude sickness. The tour season is all year round. In Uyuni, stay at “Salt Hotels”, Enjoy this unique experience. This is a complete package from Lima to La Paz, So you simply need to arrange the fight on it – international & domestic flights. Return flight depart from La Paz, and by connecting La Paz / Lima, the international flight can fix with Lima IN/OUT, will be simpler. 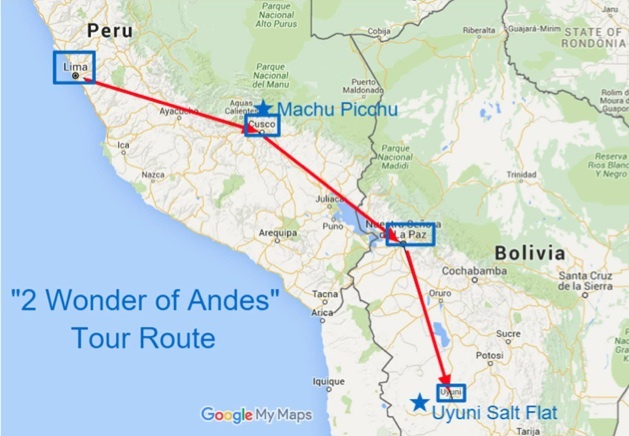 The program covers two of the most popular tour spot of the Andes at once, Machu Picchu (Peru), and Uyuni Salt Flat (Bolivia), so the perfect choice for the first- time visitors. The tour date is open. This is the custom departure tour of year-round. You can set the tour date any time of the year or join our fixed departure date. The tour is confirmed with minimum 2 passengers, so it’ll be suitable for friends or family trip. The hotel grade is various from moderate “Superior” class up to high-end “Luxury” class hotels. You can choose the hotel grade. Day-3 Cuzco / Sacred Valley Fly Lima to Cuzco. 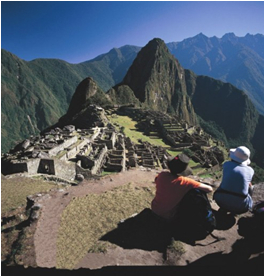 Cuzco city tour, ruins tour. Transfer to Sacred Valley. Overnight in Sacred Valley. 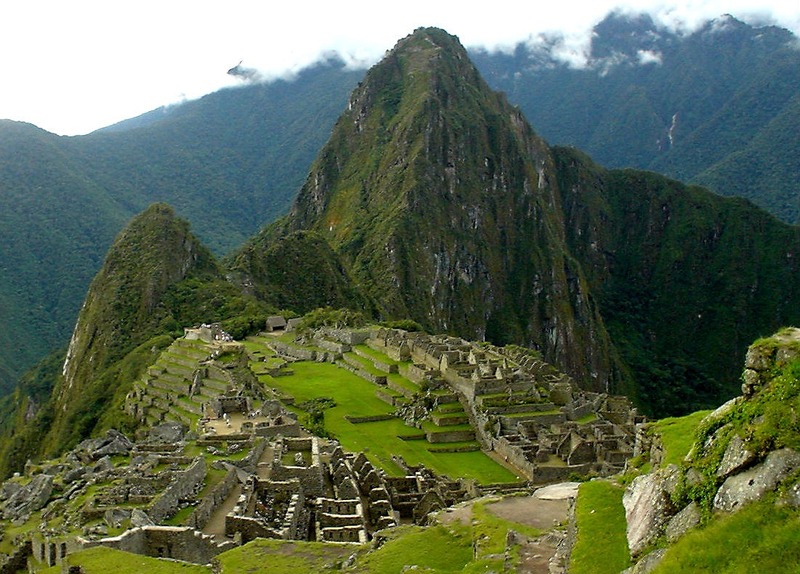 Day-4 Sacred Valley / Machu Picchu Sacred Valley tour. Visit Pisac & Ollantaytambo. Train to Aguas Calientes. Overnight in Aguas Calientes (Machu Picchu village). 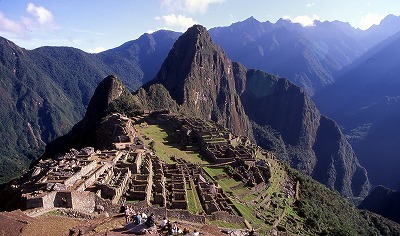 Day-5 Machu Picchu / Cuzco Machu Picchu tour. Back to Cuzco by train. Overnight in Cusco. Day-6 Cuzco / Uyuni Fly Cuzco to Uyuni via La Paz. Overnight at “Salt hotel”. Day-7 Uyuni Uyuni Salt Flat tour. Overnight at “salt hotel”. Day-8 Uyuni / La Paz Fly Uyuni to La Paz. La Paz city tour. Overnight in La Paz. Package includes: 8 nights in hotels of your choice, hotel breakfast included, Guides in English, All transfers and tours indicated in the itinerary. Vistadome class train to Machu Picchu, entrance fees and tourist ticket costs to determined historical, natural, or religious landmarks that are managed by the local authorities in many cases. Costs may increase without prior warning. We will notify you of these immediately and adjust the prices accordingly. Early check-in, late check-out (it may be required for adjusting to your flight itinerary). Services and food not listed in the itinerary, beverages during the meals, hotel extras, and personal expenses. Tips for guides, drivers, and other local staffs.